Tracing the evolution of specific topics is a subject area that belongs to the general problem of mapping the structure of scientific knowledge. Often bibliometric databases are used to study the history of scientific topic evolution from its appearance to its extinction or merger with other topics. In this chapter, the authors present an analysis of the academic response to the disaster that occurred in 1986 in Chornobyl (Chernobyl), Ukraine, considered as one of the most devastating nuclear power plant accidents in history. Using a bibliographic database, the distributions of Chornobyl-related papers in different scientific fields are analysed, as are their growth rates and properties of co-authorship networks. Elements of descriptive statistics and tools of complex-network theory are used to highlight interdisciplinary as well as international effects. In particular, tools of complex-network science enable information visualization complemented by further quantitative analysis. The subject of this chapter unites two major topics: complex-network science and scientometrics. Both topics reflect new trends in the evolution of science and, on a more general scale, in the evolution of human culture as a whole. Both are tightly related to the notion of complex systems which is gradually appearing as one of central concepts of our times. Usually by “complex system” one means a system that is composed of many interacting parts, often called agents, which display collective behavior that does not follow trivially from the behaviors of the individual parts (for recent discussions see e.g. Thurner 2017, Holovatch et al. 2017). Inherent features of complex systems include self-organization, emergence of new functionalities, extreme sensitivity to small variations in initial conditions, and governing power laws (fat-tail behaviour). In this sense science itself, both as an enterprise that produces and systematizes knowledge as well as the body of this knowledge, is an example of a complex system. The above inherent features are ubiquitously present in different forms of scientific activity. Some of them will be a subject of analysis in this chapter. Science is an integral part of general human culture. In this sense scientometric research is related to humanities. It is meaningless to talk about any metrics isolated from the context, which is caused by the history and philosophy of science. In the field of scientometrics, science itself is the subject of analysis: What is the structure of science? How do interactions between different scientific fields occur? What is the impact of a certain field, certain scientific article or of certain academic institutions? These and many more questions lie within the parameters of scientometric studies. Numerous indicators have been invented in order to quantify answers to these questions. Currently almost everyone in the academic world is familiar with metrics such as the impact factor, citation index, Hirsch factor and similar ‘magic’ numbers frequently used in science-policy and management contexts. These metrics are usually based on citation and bibliographic data. To acquire interpretable information from such large amounts of interconnected data, special tools must be used. The results are highly applicable in this case; new knowledge about how the system of science is organized can be used to improve it on different scales. Therefore, visual representation of data and of the results of its analysis becomes vital. An analysis of the evolution of a scientific topic is considered in this chapter. Such a case study is used here to describe some of the tools and methods useful for bibliographic data analysis. The questions discussed previously in the work (Mryglod et al. 2016) concern a very subtle effect one can experience in the evolution of scientific studies: How does a new topic in science emerge? When does it appear? How does it evolve? What are the principal factors involved in its development? Amongst different ways to approach these questions, and to quantify the answers, an obvious idea is to analyze the dynamics of scientific publications paying attention to content analysis, disciplinary targeting, institutional involvement, etc. In the case study presented below, authors map out the academic response to the disaster that occurred in 1986 in Chornobyl (Chernobyl), Ukraine, considered as one of the most devastating nuclear power plant accidents in history (Alexievich & Gessen 2006). The results from (Mryglod et al. 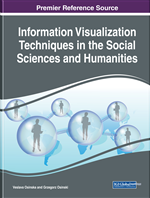 2016) are used in this chapter to create an appropriate canvas to illustrate the application of visualization techniques. The science of complex networks gives an essential methodological framework enabling one to describe complex-systems behaviour in a quantitative and predictive way (Albert & Barabási 2002, Dorogovtsev & Mendes 2003, Newman, Barabási, & Watts 2006). Moreover, another goal of a complex-network approach is that very often it allows one to visualize the system under consideration. In turn, both quantitative descriptions and visualizations enable understanding of complex-system behaviour. One of the goals of this chapter is to show how such an approach works when combined with other ways of scientometric analysis using the above case study as an example.